Purpose: Use this document as a reference for how to setup PrePay deductions in ctcLink. The Pre-Pay setup process is done typically for employees who are entitled to health benefits coverage for the full year, but only receive a paycheck for part of the year. This process allows for a one-time lump sum deduction using the pre-pay deduction code associated with the original deduction code. On the paycheck where the one-time pre-pay deduction is taken, you will see the regular deduction amount plus the pre-pay lump sum deduction amount. After that, you will not see any deductions until the pre-pay balance is reduced to zero, at which point, the original deduction will begin automatically. All employees should have a “Pay Cycle” assigned to them, which you can see in the Employee PrePay page (Navigation: Main Menu > Payroll for North America > CTC CustomEmployee PrePay). The Pay Cycle should be assigned to the employee as part of the New Hire process, but can also be done after hire. NOTE: PrePay deductions are taken based on the PrePay calendar set up schedule. PrePay payments to the vendor are sent when the deduction is not withheld from the employees paycheck or the employee is not paid but still in an active HR Status. There are 3 key parts to setting up the PrePay Deductions, 1. Verify PrePay Deduction Mapping, 2. 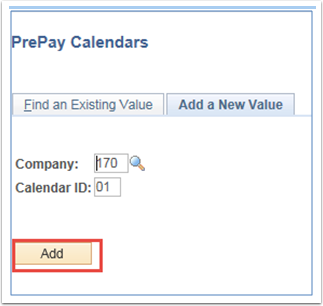 Create the PrePay Calendar and 3. Assign the PrePay Pay Cycle to the employee. NOTE: PrePay deductions are taken based on the PrePay calendar set up schedule. PrePay payments to the vendor are sent when the employee has an existing pre-pay balance for a deduction. 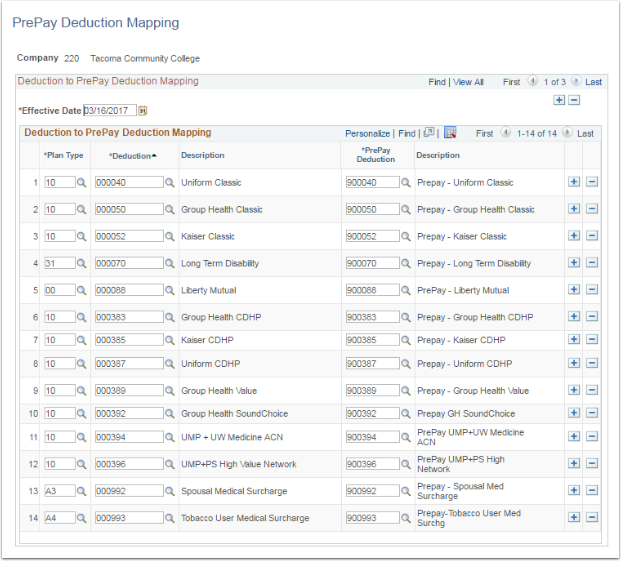 The PrePay Deduction Mapping table should already have deduction codes applied. Check to make sure the deduction code you need to add to your PrePay Calendar is included in the PrePay Deduction Mapping. If not included, contact ERP Support to have it added to the Mapping Table. NOTE: It is likely you will only need one PrePay Calendar for the year. 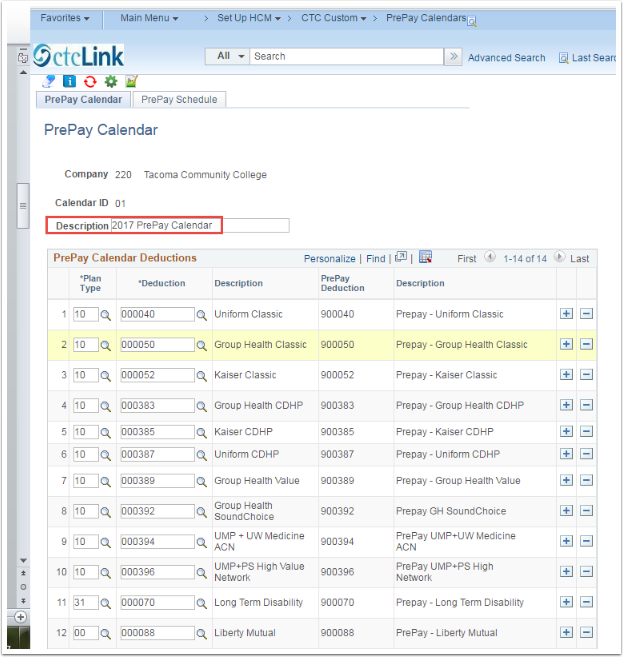 One PrePay calendar can accommodate many Pay Cycles/PrePay Schedules. PrePay calendars do not need to be recreated each year. If an employee has a Pay Cycle assigned then the PrePay calendar will be applied automatically each year based on the PrePay Calendar Schedule. 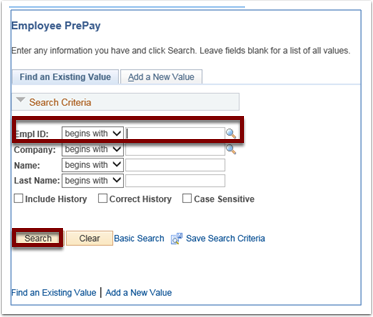 If you don’t want the PrePay calendar to be applied to an employee, assign a Pay Cycle that does not have an associated pay schedule (ex: 06A) to that individual employee. Select the Add a New Value tab and enter the Company and Calendar ID you want to create, then select the Add button. Enter the Description of the Pay Calendar (ex: 2017 PrePay Calendar). 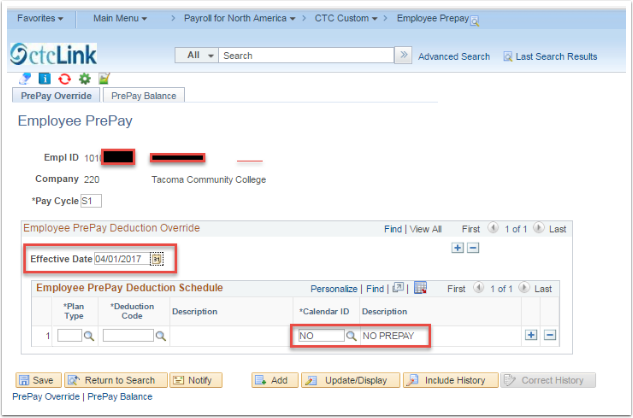 In the PrePay Calendar Deductions section, select the Plan Type and Deduction Code you need to attach to this calendar. NOTE: You can assign all plan types and deduction codes to one calendar. Select the [+] Add a Row button to add another deduction code to this calendar until all deduction codes are added. Select the PrePay Schedule tab. NOTE: Pay cycles have been established outside of ctcLink, your benefits administrator can provide the list. 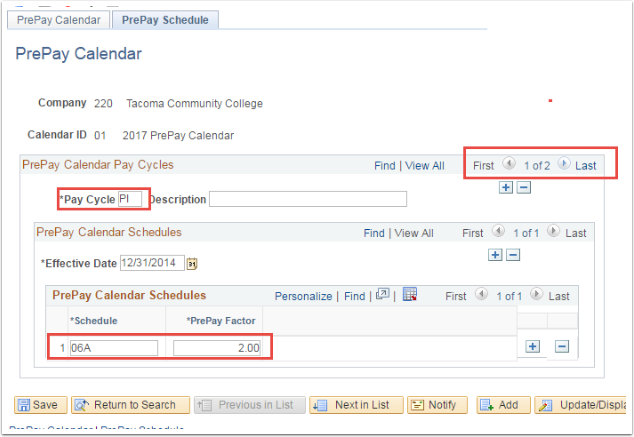 Pay Cycles are used to apply a prepay calendar schedule to an individual employee or group of employees, ie: Pay Cycle F1 could be used for all Full Time Faculty; C1 could be used for all Classified employees. Each college has already established Pay Cycle codes so use those or create new ones as needed. Pay Cycles will determine the Schedule and PrePay Factor for the row you are creating. Enter the PrePay Factor (this is the number of pay periods that the one time, lump sum PrePay deduction will cover for the Pay Cycle assigned to this calendar). 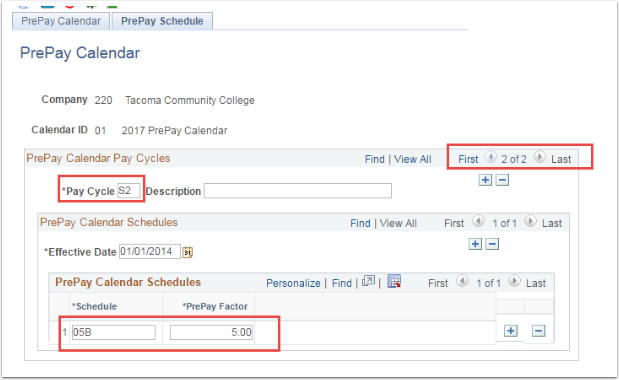 NOTE: You can set up multiple Pay Cycles with PrePay Schedules on one PrePay Calendar. In this example there are two pay cycle rows, but you could add a row for each pay cycle in your company. This will allow you to only have to create one Pay Calendar for the year. In this example, row 1 of 2 is for Pay Cycle P1, which will apply the one time, lump sum PrePay deduction on the 06A, this amount will cover 2 pay periods. NOTE: You can set up more than one PrePay Schedule on the PrePay Calendar. On Row 2 of 2, Pay Cycle S2 will apply the one time, lump sum PrePay deduction on the 05B payroll, this amount will cover for 5 pay periods. Enter an Empl ID and select the Search button. NOTE: You also have the option to override the prepay deductions in the Employee PrePay Deduction Override section. You might elect to override a specific deduction for the employee if that deduction does not need to be included in the prepay setup. Below is an example of a prepay override. In this example, the override is to prevent the Uniform Classic deduction from being applied as a prepay deduction. In the PrePay Override tab, select the Plan Type and Deduction Code that the override is to be applied. 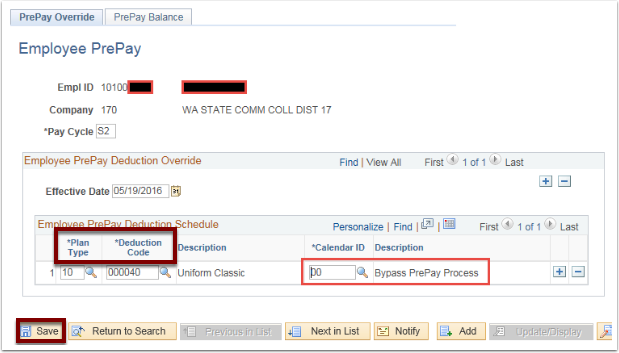 To prevent the specific deduction from being applied, select the Calendar ID of 00 "Bypass Prepay Process". Based on this override, all prepay deductions that are tied to the S2 pay cycle will be applied for this employee except the Uniform Classic deduction. To prevent any prepay deductions from taking place for a specific employee, you can select the PrePay Calendar "NO PREPAY" in the Employee PrePay Deduction Override section. NOTE: You can also apply a different prepay calendar to the employee prepay record by selecting the calendar that you wish to override with. The "Create Pre Pay Deductions" process needs to be run during the payroll processing day, for the pre-pay deductions to reflect on the paycheck.